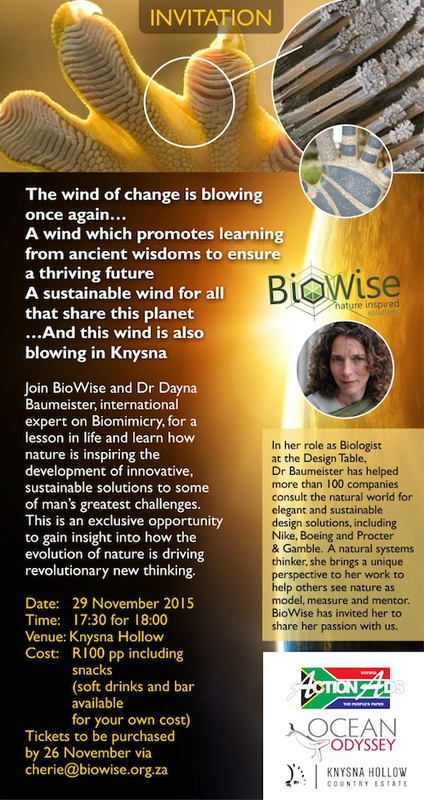 INTERNATIONAL BIOMIMICRY EXPERT IN KNYSNA Dr Dayna Baumeister, Biomimicry expert from the US, is doing a presentation on the topic at Knysna Hollow Country House on the 29th of November at 18:00. Sue Swain, Executive Director of BioWise, said this is a major coup for the area. “Dr Baumeister is in South Africa presenting on Biomimicry in Mpumalanga and Johannesburg and we invited her to share her passion with us. We are extremely fortunate to be able to listen to her on our own doorstep. It is an exclusive opportunity to gain insight into how the evolution of nature is driving revolutionary new thinking.”Biomimicry 3.8, founded by Baumeister together with Janine Benyus, described the Biomimicry process as helping innovation leaders solve human problems with the brilliance of nature’s design. “In her role as biologist at the Design Table, Baumeister has helped more than 100 companies consult the natural world for elegant and sustainable design solutions, including Nike, Boeing and Procter & Gamble. She is an inspiration. A natural systems thinker, she brings a unique perspective to her work to help others see nature as model, measure, and mentor,” said Swain. For more information contact Sue Swain on sue@biowise.org.za or 084 7736 084. Caption: With a background in biology, a devotion to applied natural history, and a passion for sharing the wonders of nature with others, Dr Dayna Baumeister has worked in the field of biomimicry with business partner Janine Benyus since 1998 as a business catalyst, educator, researcher, and design consultant. 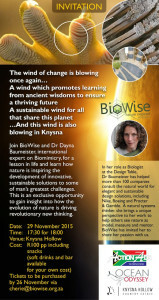 MEDIA RELEASE BY KNYSNA PR | Nicci Rousseau-Schmidt on behalf of BioWise Solutions.